Reprinted with permission from Soil & Mulch Producer News, May/June 2008 p. 13. With the world gripped by a crisis in the costs and availability or basic foodstuffs, a new focus on the threats to the planetï¿½s topsoil by unsustainable farming techniques and urban development has emerged, reported redstateupdate.net. The United Nations has said that soil loss is a contributing factor to malnourishment in impoverished populations. The National Academy of Sciences reported that US topsoil is disappearing ten times faster than it is created through a chemical and biological process that takes years. 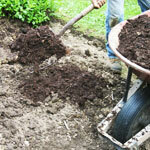 Topsoil is created at a rate of one to two inches every one to two hundred years. David Montgomery, a geologist at the University of Washington told the Seattle Post Intelligencer, ï¿½The estimate is that we are now losing about 1 percent of our topsoil every year to erosion, most of this caused by agriculture.